One of the inescapable conflicts from prehistory through the Medieval period was the struggle between settled peoples and nomads. Settled peoples with agriculture and government could produce larger armies with organization through hierarchy. They could also be poorly trained and overly centralized. Central Asian nomads, from the Scythians and Huns of Ancient times to the Mongols of the thirteenth centuries were skilled horse warriors Their lack of centralized statehood made them prone to fighting each other especially concerning the question of succession. Technology of the cities was not an advantage until gunpowder weapons became quick and dependable. The Byzantine Empire of the tenth and eleventh centuries struggled with nomads, just as its counterpart in China, the Song Dynasty, was as well. Both empires arrived at the same solution, which was to play upon the natural rivalries of nomads by favoring one group over another, and then changing sides. This strategy did not work well in the long run for the Chinese, as nomadic rivals eliminated themselves leaving the Song Dynasty alone against the Mongols. The Pechenegs were a Turkish people who moved into the Byzantine orbit on the southwestern Eurasian steppes in the ninth and tenth centuries. As part of the shifting alliances of that period, they fought against and with the Byzantines, Rus, Bulgarians and Hungarians. 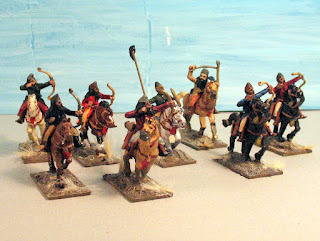 These 28mm figures are from Old Glory. 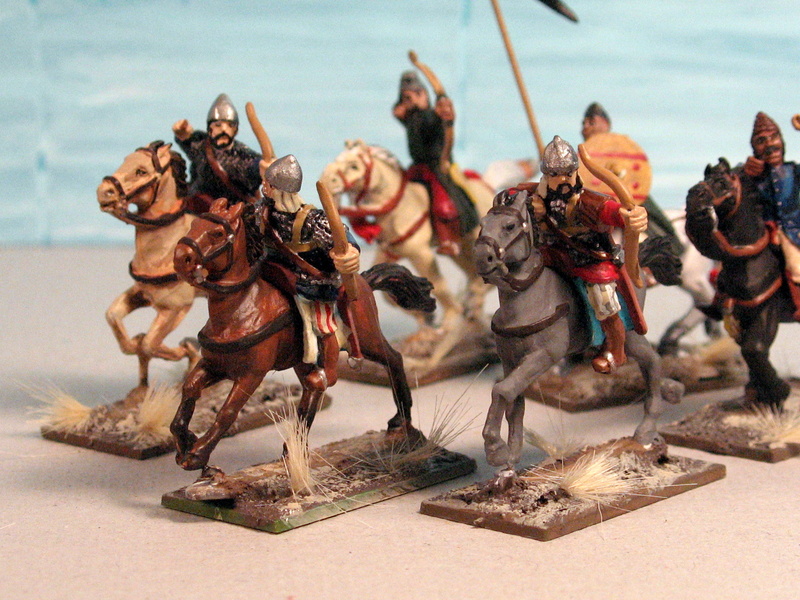 I painted them in solid, but somewhat bright colors based on a depiction of their victory over Sviatoslav I of Kiev. Their figures are a good value, and while I wish the horses were a bit sharper, they represent the smaller but bulkier steppe horses better than most other manufacturers that I have seen. Militarily, Byzantine response to nomadic raiders was to incorporate missile cavalry into their own forces. 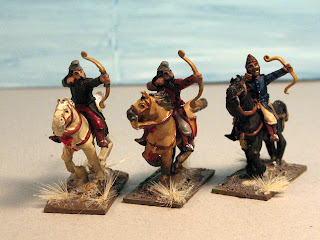 A notable example was Tacitus, a Christian Turk (probably Pecheneg) who led a group of Byzantine horse archers accompanying the First Crusaders across Asia Minor. 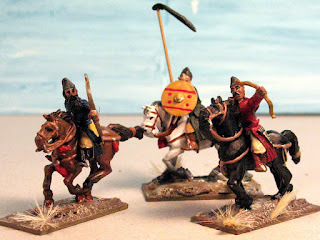 The Byzantine Horse Archers are by Crusader, and are really well done. 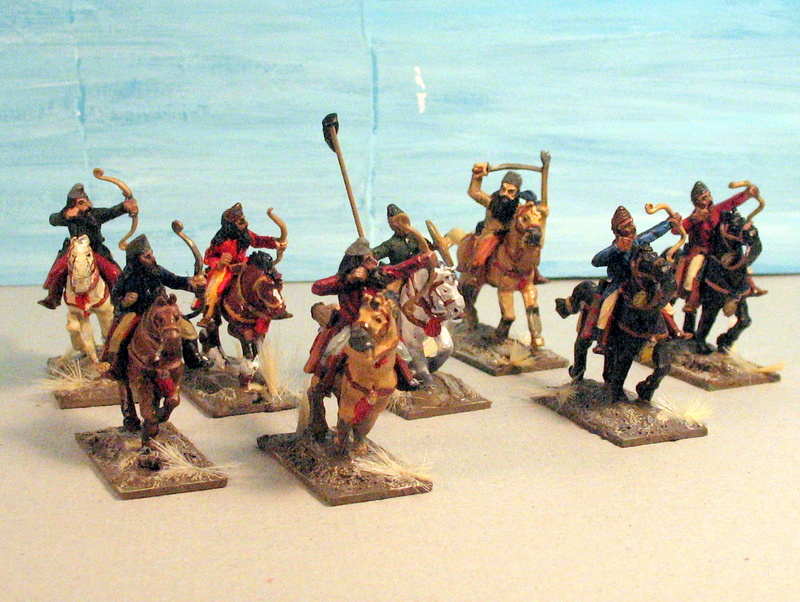 Their horses are some of the best, and the figures all show slight variations in dress, appropriate for light cavalry. Reading Recommendation: The best explanation I have read on the role of gunpowder in the conflict between states and nomads is in Kenneth Chase's Firearms: A Global History to 1700. It is a near comprehensive look at how firearms changed warfare in China, Europe, the Middle East and Japan in the late Medieval and Early Modern periods. Thanks, over the next week or so I will have the rest of the Byzantines photographed and posted - some spearmen, command and heavy cavalry.